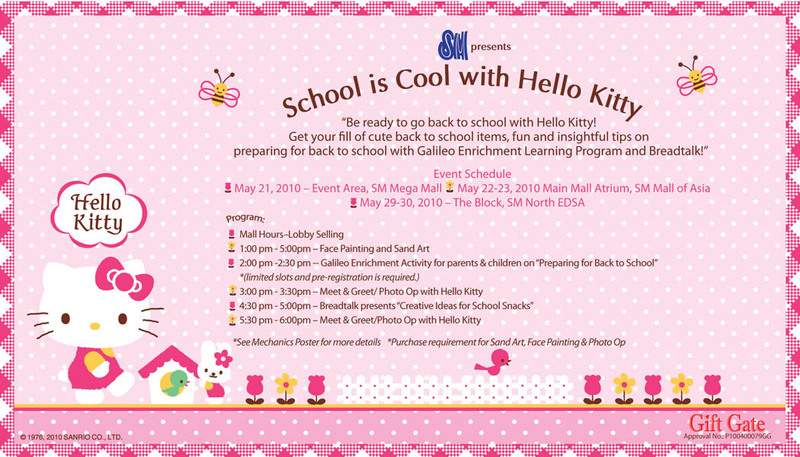 I’ve always felt a sort of kinship with people who go gaga over Hello Kitty. Admittedly, in a not-so-distant past, I was one of them. And as much as I want to pretend that my Kitty obsessive days are a thing of the past these days, I have to admit that should this reach Manila, I will definitely fall in line for these. Meet McDonald’s Sg x Hello Kitty Fairy Tales. As of this writing, this is an offer made available to McDonald’s Singapore patrons from May 30 to July 3, but as reports have it, they are gone as quickly as they are stocked. The unexpected shortage is causing a major furor from fans of the feline. The dolls can be had for only SGD4.60 each with every Extra Value Meal purchase. The last doll in the picture, the one in red, can be purchased only through online orders, but this created a deluge of online orders that, in turn, caused a temporary disruption of delivery services. One doll is featured per week, with the following schedule (see below), but the first week wasn’t even over when stocks ran out from the huge demand. Tonight, at midnight, expect the second doll to make waves as fans anticipate its release. So if you’re up and about then, better make sure you’re in line for breakfast. This same promotion was made available in Hong Kong in July of last year, with the same overwhelming reception. People flocked to stores to buy, and in many cases, buy more than they actually needed and wanted. The demand it created was so great that online sellers made profits over reselling these dolls. The dolls have yet to reach Manila but already, I am stretching my legs and flexing my knees for the mad dash to the nearest McDonald’s store. I hope that when they do come, McDonald’s Philippines will have learned the lesson of its Singapore counterpart: that when it comes to Hello Kitty, there is no such thing as having enough. Do you collect still? I visit your blog because I like your collections. Seems like a shame that you stopped collecting and writing about them. I know I haven’t been much of a collector (or a writer) lately. After all that has happened with us in the last six months, cute kawaii things have obviously been last in my mind. Having lost so much – our peace, sense of security, and joy- we realized that no material possession could ever make up for the loss of these precious things. One afternoon, as I surveyed all that was left of the rampages’ wreckage, I decided that a life of hoarded, unopened boxes was not for me. This, however, does not mean I’ve totally gone the way of the ascetic. What I have since acquired is a heightened prudence in choosing what works with our lives and what does not. This has shifted my perspective considerably; from the wanton purchase of pure eye candy, I now practice functionality and purpose as my most important criteria of selection. That it can be cute is an added bonus. I know, I know. All you want is an answer. Yes, I do. And just to show you that I still do, let me introduce Part 1 of My Favorite Things (because I do like lots of things, I just don’t need to buy them all). 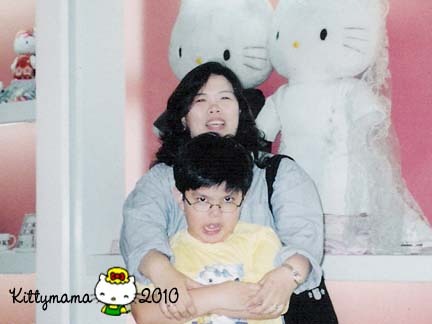 I am Kittymama for a reason; I like Hello Kitty. Still. Far from the Kitty-addicted momma I was three years ago when I started this blog, I am now at a point in my life when I am ready to give many of them up. And they will go too (the task of documenting them in pictures is arduous). But things like these, I choose to keep. 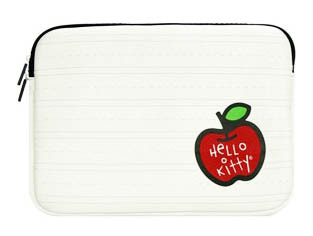 P. S. I’ll post the links to these wonderful online shops when I am off the iPad and on the PC. My PLDTDSL connection has been highly unstable since the last typhoon. (You should hear Alex grumble about this.) Good thing there’s mobile Internet to the rescue. I’m nursing a rather bad cold and right now, all I really want to do is curl up in bed and wait to be pampered with room service. But this being a household of an unusually hyperactive teenager (these last few days have been really manic for Alphonse), I guess I’d have to content myself with a cup of coffee in bed and a Kindle to cuddle up with. Room service might seem like a farfetched dream right now, but I hope it comes true when my husband comes home tonight. 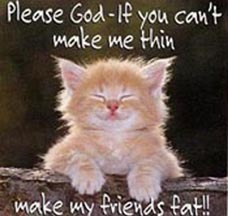 I need some babying, for goodness sakes! And since we’re on the subject of what I need, aside from a working list of new Sylvanians, how about this for starters? 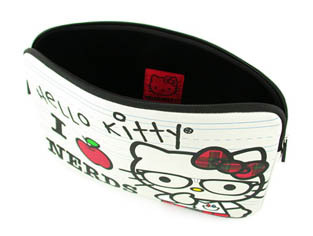 I absolutely love Hello Kitty Nerd designs. Of all the newer designs in the past year, this one resonated with me the most. 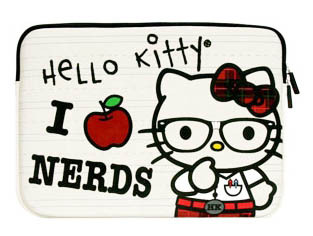 I have a red HK Nerds shirt and a scarf my husband got from Torrid and a Loungefly HK Nerds wallet from Sanrio Luxe. 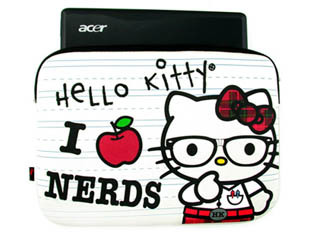 Now, wouldn’t my laptop look even cooler with this? Okay, back to bed for me now. If you see anything cool in Kitty world, give me a holler, would you? I need me some Kitty love right now. 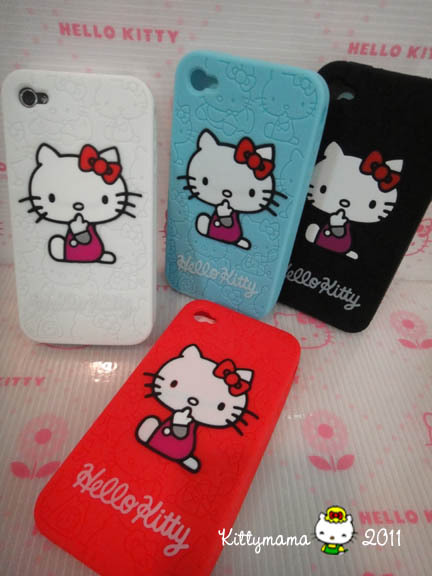 Who says Hello Kitty is dying? 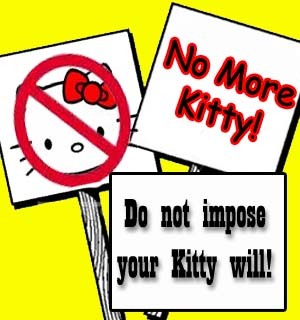 Someone at the New York Times (see “In Search of Adorable, as Hello Kitty Starts to Fade,” 14 may 2010) must have gotten it wrong as fans don’t see Hello Kitty fading out from mass consciousness any time soon. How can she be “running out of lives” when the most kawaii Hello Kitty things still come up and hit it big in the markets? Still not convinced? 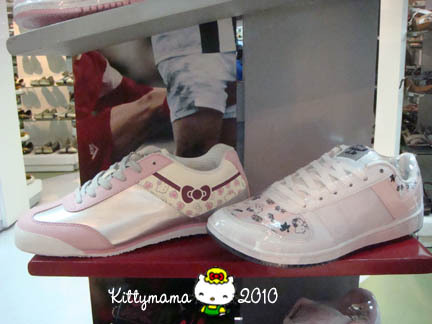 How about the newest Hello Kitty shoe collaborations as proof? I need only three letters to describe them, friends. I’m not much of a boot person, though, once upon a time, back when my ankles were much, much thinner, I did traipse around the city in thick working men’s Doc Martens too. Back then, DMs were statement shoes, and anybody who wanted to be cool (even in this beastly hot city) owned at least a pair. They were heavy, but comfy. And yes, if you needed to stomp on the foot of a rogue boyfriend, these were your best bets for making your mark. Now that I am much older, my ankles much thicker, and I have no pressing need to stomp on the foot of an erring spouse (I got lucky- I married an angel! ), I prefer the more sedate Mary Janes. Kitty inspired, of course. 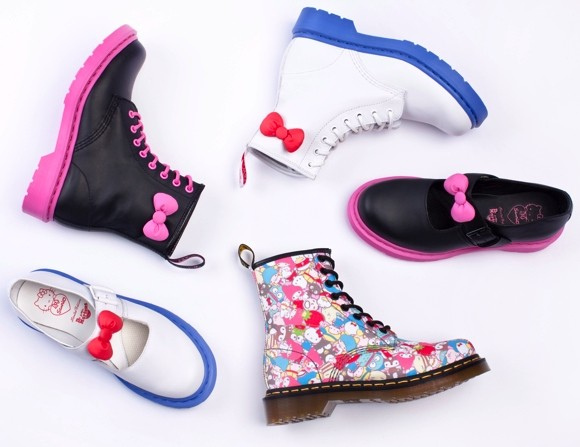 The Doc Martens x Hello Kitty footwear will be available in September. Whether they make it to the country is another matter altogether. 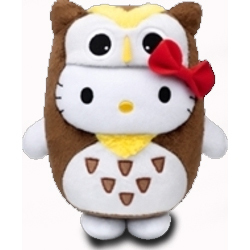 Oh, well, there’s always Sanrio.com. Now, when it comes to more casual wear, how about Pony’s contribution to the Kitty world, the Pony x Hello Kitty limited edition sneakers? (Not My Little Pony, silly!) They come in a variety of styles, in two high and four low top designs. Pale pink, silver and white are the predominant color palettes for four of the designs while black, white and red mark the other two with a dash of cutesy boldness. 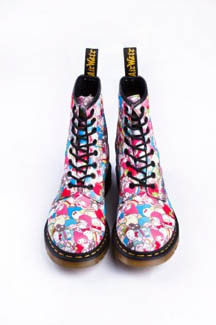 These sneakers speak the language of Kitty coolness yet reveal the sensitive side to your hiphopping soul. 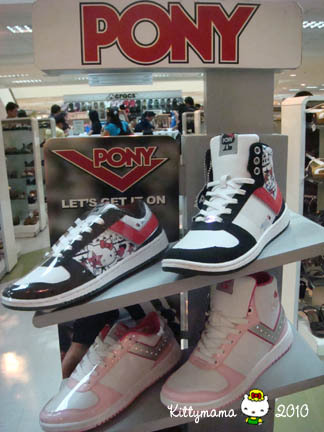 At PhP3295 for the low tops and PhP3495 for the high tops, they’re not so expensive and cost less than a pair of Skechers shape-ups. I have to admit that I am still deciding on this one. I loved sneakers while growing up; they were, in fact my staple shoes for many years, even in med school. But Crocs have got me spoiled with no laces to tie and no eyes to thread. The slip-on comfort of my Hello Kitty Crocs and my non-HK Prepair beats the rigor of adjusting laces for swollen feet or ingrown toenails (eeewww). I guess that’s why I love Mary Janes over the boots, too; no fuss slip-on is more my style. Now, were Pony to come up with a style that features, uhm, lemme see…ehrm,velcro, you’ll find me beating down mall doors just to be the first to get one. As it is, I’m waiting till the weekend to decide. 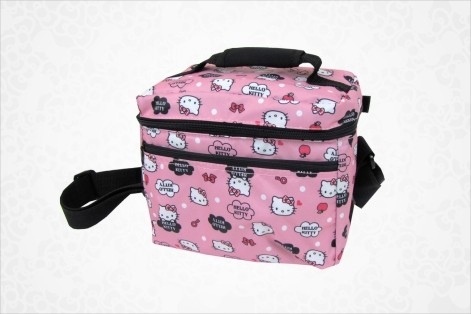 At 36, we all know that Hello Kitty is not destined to be top cat forever. Newer, brighter, younger things may eventually outshine her. I sincerely doubt, however, that she will go the way of the dinosaur. For as long as interesting things come up, I think you’ll find her aging spirit there. Yes, she may be a little long in the tooth, but who cares? She’s got no mouth to show it anyway. I woke up unusually late this morning, feeling sluggish and slowheaded. As much as I wanted to crawl back under the covers and get a few more hours of shuteye, I had to get up, else, Alphonse will follow and sleep through the day as well. I know I should not have stayed up last night to finish Stephen King’s new 1074-page novel, “Under The Dome.” (What can I say? Stephen King’s magic is sooo back!) What I really wanted to do was finish my dollhouse and take some pictures but the book, waiting for me since New Year, beckoned. I could not resist. Guess what woke me up from this numbing stupor. 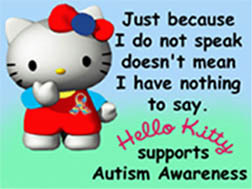 Have a happy Hello Kitty day, friends!